Hello guys, my name is Simona Zion. I’m a jewelry designer and I’m obsessed with crystals. If you too consider yourself a modern witch, you are on the right place. 🙂 In this little column I will teach you how to use your favorite crystals, to soothe your mind and body and when we’re done with that, we’ll make a beautiful jewelries out of them. 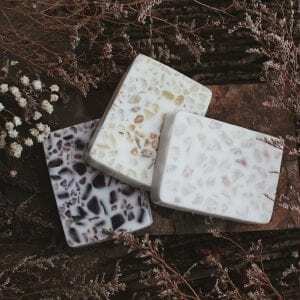 This massage bars not only become infused with the healing properties of the crystals, but they also act as an extra textural sensation for your massage. Peppermint, clary sage and rosemary essential oils are useful for moving stagnant energy. These oils will get your circulation moving and soothe sore, tired muscles. Begin by filling your pot with water and placing it over medium-high heat. Measure out your butters and beeswax, and place into glass measuring cup. Place the measuring cup into the water. While these melt together, set out your molds. Fill each mold with 1 tablespoon of fluorite chips. Shake the mold so the chips settle evenly in one layer across the bottom. If you want to try different-size crystals, you can experiment and add small to medium-size polished quartz and fluorite to your molds. Different size can give different sensation on the skin. Once the water begins to come to a near-boil, turn the heat down to low; Stir every 5 or so minutes. Let the butter mixture melt completely. Once there are no pieces left, add in your essential oils using a pipette, or if your essential oil come with a dropper, drop the oil into the melted mixture. Stir completely to incorporate. Carefully put the mixture into the molds. Let the bars dry for 3 to 4 hours before unmolding. Stack them in a glass jar to keep them fresh or to give as a gift. To use, rub the bar all over your body, with the crystal side facing your body. Always move away from the heart, down to your extremities.